It's hard to think of the Motor City  a popular symbol of urban decay  as a vacation destination. But somewhere behind its neglected, graffiti-covered skyscrapers are charming reminders of a city that was once among the world's wealthiest. Today, rows of homes and stores that had been abandoned for decades are finally being demolished, making way for lush green spaces that give some sections of the city an odd rural vibe. Several new hotels, restaurants and art galleries have the potential to burnish Detroit's image further and revitalize the downtown area. Detroit's premier event is, of course, the North American International Auto Show, held each January  but that's hardly the most appealing time to visit the Midwest. So unless you're an auto-industry exec, advertiser or journalist, it's better to visit Detroit in summer. Toward the end of the season, in August, you can catch the Woodward Dream Cruise, a one-day, multi-city celebration of the automobile, replete with parades, music and food. 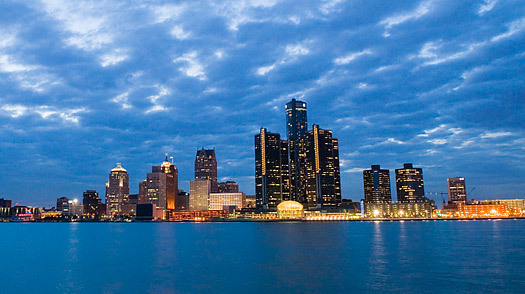 Or visit over Labor Day weekend for the annual Detroit International Jazz Festival. In any season, Detroit is a sports mecca, so be sure to catch a Tigers, Red Wings or Lions game during your stay. Read on for Detroit's other key attractions. Detroit Guide: Find travel deals, hotels and more!